Okay, here’s a weird one. 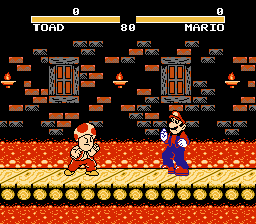 Kart Fighter is an unlicensed “pirate original” fighting game for the Famicom which features characters from Super Mario Kart beating the holy hell out of each other, Street Fighter style. Sound like Super Smash Bros? It shouldn’t. This game predates Nintendo’s own take on the genre by several years, and in fact could be cited as a source of inspiration for the creation of Smash Bros. Well, okay, maybe not. But still. Anyway, Kart Fighter is…well, it’s actually really good, surprisingly. Some would go as far to say that it’s the best one-on-one fighting game on the NES, though its only serious competition is Joy Mech Fight, TMNT Tournament Fighters, and all that unplayable pirated crap like those “ports” of The King of Fighters, Mortal Kombat, and the dreaded Cony versions of Street Fighter. 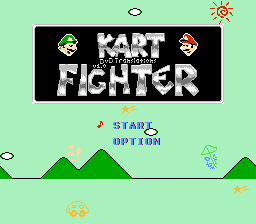 Among its bootlegged peers, though, Kart Fighter reigns supreme. 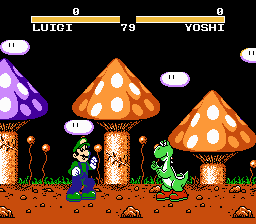 The game positively reeks of effort - all character sprites are original and unique to this game, and are large, colorful, and well-animated. 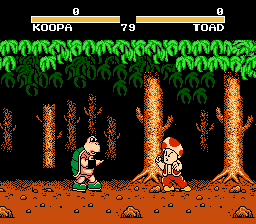 The gameplay isn’t perfect, but it’s at least existent, which is more than you can say for any other pirated fighting game ever made for the NES. It’s actually playable, for chrissake. PLAYABLE! Heavens! It’s not an excellent game by any means, but its mere concept and the decent amount of quirk contained within (dig the game’s inexplicably capable and hot interpretation of Princess Peach) make Kart Fighter very much worth playing. If only for a few minutes. And yes, the game has a two-player mode. Press left or right on controller 2 at the character select screen to enable it. Have a fun! 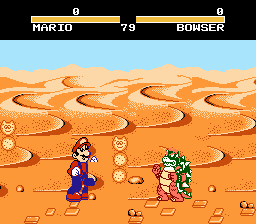 The original game contains the Japanese names of characters, Yossy for Yoshi, Nokonoko for Koopa Troopa, Koopa for Bowser, plus some intentional incorrect spellings, Mari for Mario, etc. This patch fixes all the character names you see both during the game and on the high score table, and also makes a few small graphical changes, to further enhance your Kart Fighter experience. Shame he couldn’t do anything about the game’s crippling flickering problem, though. Oh well, that’s what FCE Ultra’s “allow more than 8 sprites per scanline” option is for. You’ll definitely want to enable that for this game, kids.